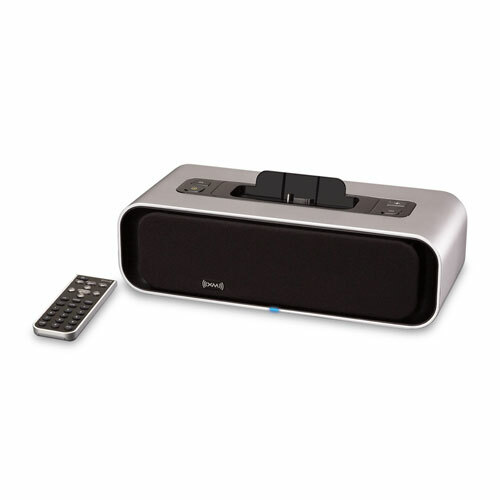 Enjoy dynamic sound from an exceptionally small system that neatly fits spaces like a night table, kitchen counter, or desk. Dynamic sound: Four 2" full-range speakers, a four-channel enhanced digital audio processor, bass boost and a 16 watts RMS amplifier deliver dynamic sound. Sleek design: Sleek design fits smaller spaces like an end table, kitchen counter, or desk. Multi-use: Audio In jack for playing an MP3, CD player, or other audio source (Aux In Cable sold separately). Private listening option: Headphone jack for private listening. LED light indicators for power, source, and volume: Always know the status of each. Included Remote Control: Delivers added convenience.